For many different reasons, West Java makes the perfect holiday destination for weekend getaways. Only two to three hours drive away from Jakarta, the eclectic province offers a different experience from that in the metropolis. Think picturesque mountains, majestic volcanoes and lusciously green tea plantations on one side and vibrant art scenes on the other – a thrilling juxtaposition we’d like to offer our readers in this first edition of Archipelago Diaries. Situated in Cisarua, Taman Safari was established in 1986 as the first true wildlife and recreation park in Indonesia. Until today, Taman Safari Bogor manages and breeds many species of animals, birds and reptiles from five different continents, emulating their backgrounds, behaviours and habitats. Besides observing the animals, visitors can also learn more about the rich flora of Indonesia during the Safari Trek programme, or go on the famous Night Safari where you can experience the thrilling sensation of exploring a wildlife sanctuary after dark. Taman Safari is definitely a family-friendly attraction. Bogor Botanical Gardens, probably the most famous attraction in Jakarta’s neighbouring city, cover more than 80 hectares of land on the border of the Bogor Presidential Palace. The gardens are beautifully maintained, featuring more than 15,000 different species of trees and plants, including the iconic Bunga Bangkai or corpse flower, known for its pungent odour. Take a leisurely stroll on the gardens’ paved walkways and enjoy the sceneries of giant lily ponds, landscaped gardens and avenues, while enjoying the vast collection of palms, 3,000 varieties of orchids and around 50 species of birds. The staff here are also behind the operations of three other major botanical gardens in Indonesia, including Cibodas Botanical Gardens, founded in 1862. If you’re looking to get away from the concrete jungle known as Jakarta, breathing in the fresh air of the tea plantations in Puncak may be a good start. Spare some time to go for a little walk along the plantations and visit a local tea factory. Sit down and have a cup of tea while enjoying the breeze. Perkebunan Teh Gunung Mas, or the Golden Mountain Tea Plantation, is located around seven kilometers from the Puncak summit and offers verdant vistas of rolling, tea-carpeted hills as far as the eye can see. Guided hikes are available for a small fee with distances varying between four and eight kilometers. Situated in Cikole-Lembang, around 20 kilometers north of Bandung, Tangkuban Perahu is an active volcano that stands at 2,084 meters high. Eruptions have occurred many times over the past centuries, causing the emergence of small craters around the mountain. Among them, there are three that attracted most tourists: Ratu, Domas and Upas. While Ratu Crater is known for its panoramic view, my personal favourite is Domas, where you can get up close and personal to the crater and even soak your feet in one of its hot calcareous springs. At its hottest spring, where the temperature reaches 100 degrees Celcius, you can even buy a bag of eggs and boil them there! Meet the most happening place to be in Bandung right now: the top of Keraton Cliff, famous for its gorgeous sunrise view. The cliff is located within the Ir. H. Juanda Forest Park area, and the best time to be there, naturally, would be right before sunrise. As the sun begins to rise behind the hills, golden rays combined with the sight of trees and a mystical mist will create a magnificent view. To get there, you can drive and park nearby the Forest Park area. However, since the roads are quite damaged and the path precipitous, it’s recommended to continue the journey to the cliff on a motorbike taxi or ojek. Kawah Putih, or White Crater, is a lake in a volcanic crater located in Rancabali-Ciwidey, about 44 kilometers south of Bandung. As the name suggests, the crater is surrounded by pale white-coloured mixture of soil and sulfur, in contrast with the turquoise water that fills the vast crater of Mount Patuha. What makes the sight even more stunning is the fact that the colour of the water will change from bluish to whitish green, or brown, depending on the concentration of sulfur and the temperature. 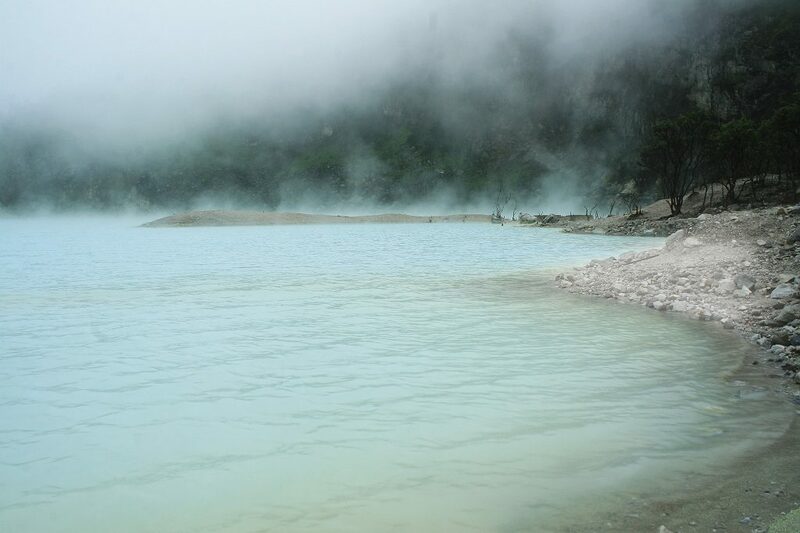 The beauty of Kawah Putih makes it a frequent backdrop of photo and film shoots. In 2010, a traditional music instrument made from bamboo pipes, called angklung, made it to the UNESCO list of Masterpieces of Oral and Intangible Heritage of Humanity – a well-deserved recognition for such a well-beloved piece of art that has long been the pride of West Java. At Saung Angklung Udjo, you’ll find an enclave of everything related to angklung. The highlight here is its daily Bamboo Afternoon Show – two full hours of wayang golek (puppet show), traditional dance,angklung performance by beginners and an angklung orchestra that featured professional musicians. I personally enjoyed the most the part when each person in the audience was given an angklung and invited to play! With well-trained staff fluent in more than five languages, there’s no need to worry about getting lost in translation. No trip to Bandung would be complete without a visit to Saung Angklung Udjo. Also be sure to bring home an angklung! Founded by renowned Indonesian sculptor Nyoman Nuarta, NuArt Sculpture Park is a hidden gem for creative souls. The park aptly showcases the works of the great Balinese artist Nyoman Nuarta, spanning from the beginning of his career to hist latest masterpieces. 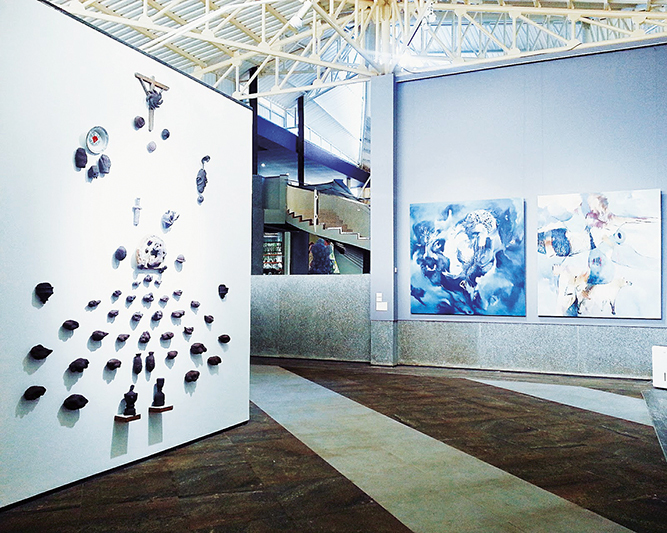 Upon entering the area, expect to be amazed by the exquisite design of the park and gallery. Stroll around the spacious park to immerse in its aesthetic surroundings that provoke inspiration while enjoying the fresh mountainous breeze. Once you’re done, fuel up with delicious treats and a refreshing drink at its Brass & Copper Café. Situated at Bogor Presidential Palace, the Presidential Museum or Balai Kirti is another famous attraction in Bogor. It was built as a tribute to Indonesia’s presidents, from Soekarno to Susilo Bambang Yudhoyono, and also to educate people about the history of the nation through the legacy of each leader. Initiated by then-President Susilo Bambang Yudhoyono in 2012, the Presidential Museum Kirti Hall has three levels. At the front porch, there is an inscription that reads ‘Every president must have done their best for Indonesia’. On the first floor, visitors will find an audiovisual room and sculptures of the six presidents. On the second floor, there are six presidential exhibition spaces, interactive spaces and a library, while on the rooftop is a canteen for visitors. The capital of West Java and the country’s third largest city, Bandung holds a special importance for Indonesia. During the Dutch rule, there was once a plan by the Dutch East Indies government to move the capital from Batavia to Bandung, in recognition of the city’s prime topography. Thanks to its cooler temperature and beautiful elevated landscape, Bandung became an exclusive European resort area, its Jalan Braga abundant with cafés, restaurant and boutique shops. Two art-deco style hotels, Savoy Homann and Preanger, were erected alongside a club house for the wealthy. The nickname Paris van Java was thus given to the city. Even today, the city remains known for its collection of Dutch colonial architecture. Soak in the history of this great city by strolling through its streets and historical buildings, from Gedung Merdeka – which hosted the Asian African Conference in 1955 – to Geological Museum, Postal Museum and the impressive Gedung Sate, which now serves as the governor’s office. Complete the day by enjoying old-school pastries at Sumber Hidangan on Jalan Braga. Established in 1929, the bakery maintains a classic ambience that preserves its Dutch heritage.